The notice at the entrance speaks loud and clear: no photographs either with camera or mobile phone. "It's to guarantee our customers maximum privacy. 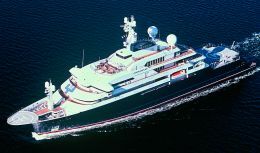 They're usually very secretive about their yachts, and rightly so," said Sylke auf dem Graben, Lürssen marketing and public relations manager. She has kindly agreed to take us round the Lemwerder yard, the main production headquarters of what we may consider one of the most aristocratic brand names at planetary level on the superyacht scene. A true leader, as its production figures demonstrate: a series of vessels whose lengths and probably values have few equals. Here all the factors comprising the production process take on the shape of an absolute value, consonant with the standard of the boats produced. Protecting them from indiscreet eyes and safeguarding the owner's privacy is therefore an aspect which is justly applied to the letter. So our Nikon stayed in the car and, donning safety helmets, we set out on the tour. The first thing we were shown in the yard - one of three along the Weser river in the hinterland north of Bremen, an overall 350.000 square metres of structures, while there is a fourth in Rendsburg, north-east of Hamburg - was the enormous spares warehouse with its 15.000 items. Here they have everything, from engines to individual screws, from warping winches to piping for the onboard systems: a display of organisation without which it would be impossible to manage such a huge amount of parts and spares. This is also the warehouse for sheet metal and sections which, with an automated system, are conveyed to the adjacent cutting room, is also of considerable size. On arrival at their destination the steel or aluminium parts are collected by specialised operators who, with the aid of machines with CAD/CAM technology, using plasma or the more precise laser systems, carry out the cutting with a level of precision that may even arrive at microns. The consequent and undeniable advantages obtained with such accuracy in the boat construction phase are evident: with tolerances reduced to a minimum, working hours can be considerably reduced and metalwork and stuccowork interventions cut to the bone. Optimal welding of the manufactured items and therefore a finished product of notable quality. 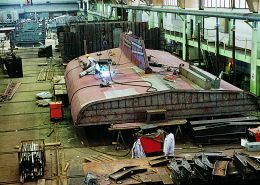 In another specialised hall the metal hulls are built in distinct parts that are then joined to form the complete hull. Work begins with the sections overturned so the workers can intervene with greater efficiency in creating the right forms which are then turned over and assembled. A brief summary of the yard's history: it was established in 1875 when Friedrich Lürssen, the company founder, built his first little rowing boat, flat bottomed in wood and still perfectly preserved. Then came motorboats, the first being 'Rems' in 1886, and then others including 'Daimler' in 1890, created largely due to the impulse given by Gottlieb Daimler himself who in those years had set up what was to become one of the world's most important car manufacturing groups. He, obviously, supplied the engines and Friedrich built the boats around them. 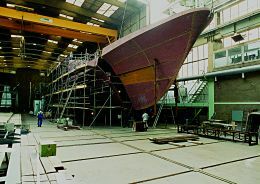 Six years later, when the yard had grown to 3.000 square metres, it had already produced its thousandth vessel, a 12 metre motorboat again for Daimler. 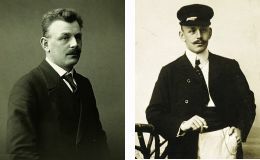 In the early 20th century Otto Lürssen came into the company, one of Friedrich's six children. A naval architect, he was able to give great impetus to motorboat production. In fact it was thanks to him that the first in-depth studies were made in the yard, leading to the creation of hulls specific to this type of propulsion. Lürssen vessels achieved astonishing speeds for the time. 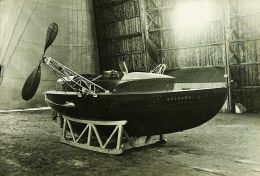 Emblematic in this context was "Donnerwetter", what we might call a concept boat today: in 1905, with an engine of only 40 HP and with Otto at the helm, it reached 35 knots. One could say that much research was done even then at Lürssen's, since already in the early 20th century the yard had achieved great fame not only as a builder of tough boats but also as a factory of ideas and avant-garde solutions, much appreciated throughout Central Europe and in the United States. In fact in St Louis in 1904, on the occasion of a boat show, the 19 metre "Maria Augusta" built by Friedrich Lürssen was exhibited. Its elegant lines and comfortableness under way were so appreciated that the organisers awarded it a gold medal. 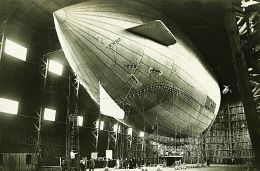 The yard's high-tech fame grew considerably, also in Germany, to the point at which Lürssen began to collaborate with other firms which in those days were considered the cutting edge of technological development, creating gondolas for dirigibles and hulls for flying boats. Meanwhile we continued our tour of the yard, department by department. After having seen the painting pavilion, the carpentry shop and the mechanical workshop with lathes and machine tools of all kinds, we managed to get a fairly comprehensive picture of production capacity and the quality of what is created here. Passing through all the work process phases we were granted hands- on experience of things that are normally unseen, concealed by the sumptuous furnishings and fittings that embellish Lürssen boats. Foams, soundproofing and heat insulation panels are positioned with maniacal care to saturate all possible spaces and cavities. And then cables, pipes, wires, conduits and everything else comprising the plant engineering systems are laid with maximum attention, ordered, numbered, banded and easy to inspect. All this is to ensure top quality also in terms of well-being and safety, which are among the yard's prerogatives that make the brand appreciated, here where the vessels are created, perfectly tangible. We were then taken to the mock-up room. We crossed the threshold and - surprise - found ourselves aboard a Lürssen superyacht, at least that's how it seemed. 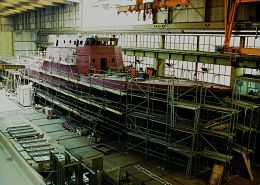 Actually we were in an area where the various spaces that will subsequently be part of the hull layout are assembled: from the main saloon to the owner's cabin, from the external gangways to the stairs that link the various decks with the cockpit. Here everything is reproduced full scale, using the same materials, the same decoration and the same furnishing accessories that will be used on board. The great thing is that all this is done solely to give owner and architects an exact perception of how the boat will be, of its correspondence to the design, but above all to understand 'from the life' if that environment meets the customer's needs in terms of both liveability and décor. Once the owner has given the OK on what he has seen here, it is faithfully rebuilt aboard the vessel. But the environment or detail created for the mock-up remains here, perhaps at the disposal of future customers who can get hands-on experience of Lürssen accuracy and quality in this room." 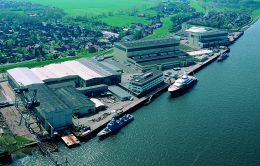 Lürssen makes boats from 50 to 170 metres but could go farther. Most working hours are spent on yachts (60%) and the rest on military or merchant vessels. The yard's history is studded with a great many boats and ships built for the German navy but also for other navies. 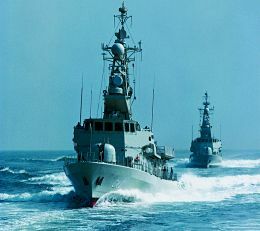 Precisely this extensive experience in a sector as difficult, selective and technical as the military (where absolute performance values are required from each individual element of the vessel) is a further feature of the brand name. At Lürssen, we were told, a great deal of research is carried out on matters concerning hulls, propulsion and appendages etc. Everything is continually optimised by the engineers with the aid of the most advanced test tanks. But also materials, work processes, accessories etc. : everything is closely supervised by highly specialised personnel. The workforce numbers around one thousand. Approximately two hundred are designers, engineers and technicians. We visited the place where the boats are designed, where everything, including detail, is studied and verified at the computer. On one screen the hull of a "boat" was simulated, with the stabilising systems highlighted; on another there were propeller support brackets which the work-station operator rotated, showing us the various angulations. 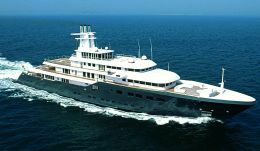 It was explained to us that Lürssen designs and produces everything in-house except certain details which are outsourced to highly trusted suppliers who manage to achieve the qualitative levels the yard demands. Sometimes they are small concerns, including Italian ones, and sometimes hyper-technological companies as in the case of engines, fins and propulsion. But it is always a small percentage of the whole boat. Most of the work is done in-house, this above all in order to ensure quality, standardised towards the optimal. There is also an elaborate team of architects, a structure already in itself capable of supervising the entire development of a ship. This team generally works closely with the owner's chosen designers to draw up the interior and exterior forms of the vessel. In this way a subdivided and efficient team is created, capable of perfect interface with the yard situation and of supervising with maximum care the growth of the vessel in all its phases. "It's like having a large orchestra," our guide said, "conducted by a great maestro: it always succeeds in giving top level performances." The visit continued and we had to take the car to get to another colossal structure standing right on the banks of the river Weser. Here we found the completely covered dock where boats to be worked on are kept. On going in we saw a very fine boat on which someone was completing the fixing of the name, "Air". The owner's name is strictly top secret. Its 90 metres of length seemed fundamentally little in comparison with the structure housing the vessel in the still waters of the dock. On board, teams of workers and technicians moved about in an orderly fashion, perfecting every detail, polishing steel and teak. The exterior was designed by Tim Heywood and the interior by Terence Disdale. As well as being beautiful and imposing, "Air" is also a hyper-technological boat that employs propulsion usually the prerogative of large merchant ships. In fact there are Azipods installed, large azimuthal feet powered by electric motors that are supplied by no less than eight big generators. Over and above keeping vibrations to a minimum, the Azipods permit the boat to manoeuvre with a facility and accuracy that would be unthinkable with conventional transmissions. With this solution the helmsman can come alongside with millimetric precision of speed and manoeuvre. Even without the aid of thrusters the boat remains totally under his control, docilely responding to every command input and manoeuvring literally in a puddle of water." Our tour was over and, as our affable guide accompanied us to the exit, we still had time for a couple of questions about the market. 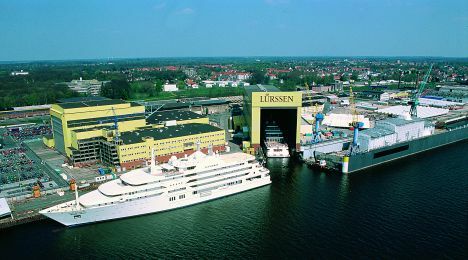 Where does Lürssen traditionally make most sales? 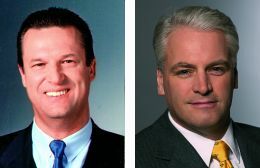 "Our reference market undoubtedly remains the United States where a large part of our production goes. Nevertheless we keep a careful eye on evaluation of what are defined as the emerging markets, in the east and on other continents, but also in Europe. 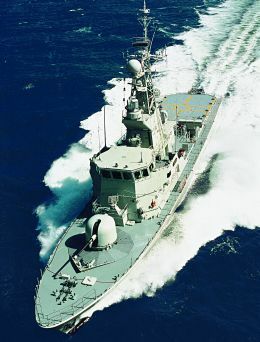 Russia for example is showing an ever increasing interest in our boats." And the Italian market: do you currently have customers in Italy? 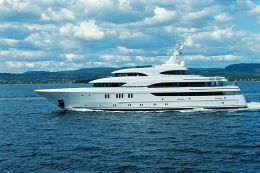 To this final question Sylke replied with a concise "no comment", a further bulwark defending owners who choose Lürssen. For further information contact Lürssen Yachts; Zum Alten Speicher 11; 28759 Bremen-Vegesack, Germany; phone +49 421 6604 166; fax +49 421 6604 170; e-mail yachts@lurssen.com ; website www.lurssen.com .